It has been three decades, with more than a million editions sold, since the GSX-R line was born. And a decade and a half has elapsed since the first GSX-R1000 transformed the open sportbike class forever. Built to Own the Racetrack, the GSX-R1000 captured the MotoAmerica Superbike Championship in its debut year asserting its claim as The King of Sportbikes. 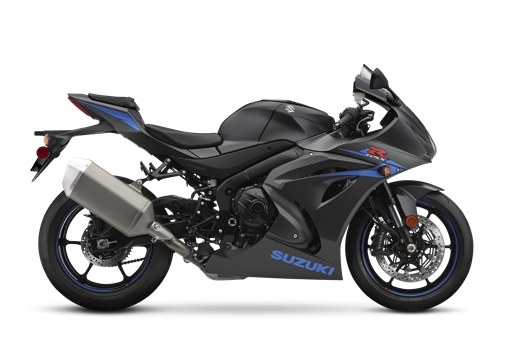 This motorcycle’s chassis forms the lightest, the most compact, the most aerodynamic and the best-handling GSX-R1000 ever. Cradled in this aluminum frame is an advanced engine that uses an exclusive Variable Valve Timing system and Ride-by-Wire throttle bodies for a wide spread of power while delivering smooth and precise throttle response Using an Inertial Measuring Unit (IMU) the GSX-R1000R’s advanced electronics package includes selectable performance modes so the motorcycle enhances and fine tunes rider inputs. The six-axis IMU lets the GSX-R1000R recognize its position on the street or race track to help the rider achieve an extraordinary level of riding performance. Up front, the unique BREMBO T-drive brake rotors grasped by Monobloc calipers connected to the exclusive Suzuki Motion Track Anti-lock Brake system provides strong, controlled braking. The precise and smooth SHOWA Balance Free suspension keeps the sticky Bridgestone RS10 tires in touch with the road. All of this forward-looking motorcycle technology is covered in all-new, wind tunnel-developed bodywork that’s uniquely GSX-R.